Johannes Gutenberg University Mainz (JGU) is welcoming the fact that the Rhineland-Palatinate Research Initiative initiated in 2008 is to continue. "This innovative research funding path will remain indispensable to us as it will provide for consistent provision of resources for our academic work and research," emphasized JGU President Professor Georg Krausch. "Long-term financial support for our research is vital for maintaining the national and international competitiveness of our university." Within the context of the Rhineland-Palatinate Research Initiative, Mainz University is pursuing a systematic strategy of concentrating resources on selected research-led disciplines, which will be receiving a total of EUR 8.5 million in additional support in 2017 and 2018. With regard to this initiative, JGU has decided to concentrate its research profile in three strongholds: the PRISMA Cluster of Excellence sponsored through the Excellence Initiative by the German federal and state governments (particle and hadron physics), the CINEMA Research Center (materials science) closely collaborating with the MAINZ Graduate School of Excellence, and the Translational Medicine Research Center. There are another nine research units that are considered to be fields of research with high potential for development (High Potentials). Thanks to its systematic emphasis on certain scientific and research topics, Mainz University has made significant progress in science and research. The continuous improvement in research capacity at JGU since 2008 is evidenced by funding within coordinated programs (Collaborative Research Centers and Research Units funded by the German Research Foundation as well as joint research projects that attract support from the European Union and research projects funded by the German federal state) and the growing success in acquiring third-party funding. In 2008, expenditure of third-party funding was equivalent to EUR 77 million; by 2016, this had increased to EUR 164 million (including competitively acquired state funding and funds expended by the Institute for Molecular Biology). Particular achievements of JGU in this regard include the PRISMA Cluster of Excellence and the MAINZ Graduate School of Excellence, both funded through the Excellence Initiative by the German federal and state governments, the acquisition of two large donations from the Boehringer Ingelheim Foundation as well as the procurement of two large-scale projects in the field of medicine, i.e., the Ci3—Cluster for Individualized Immune Intervention and the Center for Thrombosis and Hemostasis. The number of federally co-financed research institutes in the immediate vicinity of JGU has doubled and new ground has repeatedly been broken when it comes to institute-based forms of collaboration with the establishment of the Max Planck Graduate Center, the Helmholtz Institute Mainz, and the Institute of Molecular Biology. In keeping with JGU's profile formation strategy, the past ten years saw more than 40 professorships established or rededicated. The institutional involvement of outstanding academics in the university’s strategic development is a trademark of the system of university governance employed at JGU. Three institutions of excellence, i.e., the Gutenberg Research College (GRC), the Gutenberg Teaching Council (GTC), and the Gutenberg College for Young Researchers (GYR), provide the cornerstones here. They serve to provide strategic advice to the university management bodies while also providing support to exceptional individual academics and researchers. Hence, the GRC as the primary body tasked with the promotion of top-level research contributes to the profile formation strategy at JGU with regard to the Rhineland-Palatinate Research Initiative. 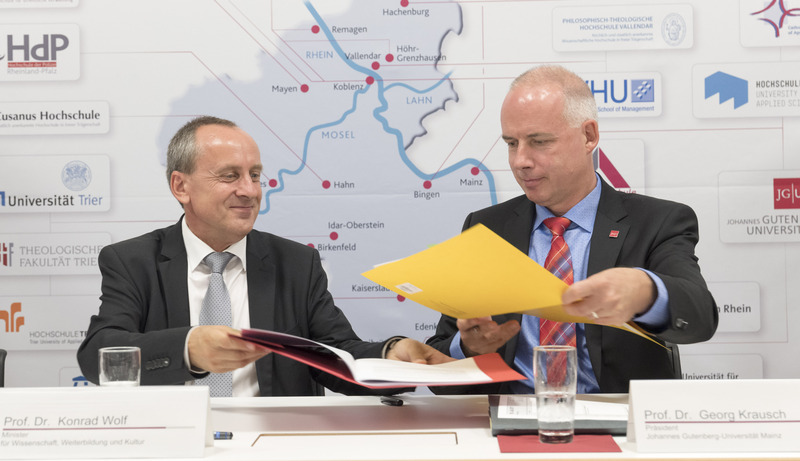 Since it was launched in the summer of 2008, the Rhineland-Palatinate Research Initiative has supported the four state universities of Rhineland-Palatinate recruit personnel, procure investment, and acquire third-party funding. In 2010, the seven universities of applied sciences in the state were also added to the initiative. The structural concept envisaged by the state's Ministry of Science was to nurture existing core research areas at these institutions of higher education and to promote their respective profile-forming strategies. By late 2016, the research initiative had a turnover worth EUR 160 million. The universities and universities of applied sciences receive a total of EUR 20 million annually in addition to their core funding to be employed to develop their profile-building research units and centers.